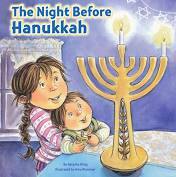 If you haven’t been introduced to Natasha Wing’s “The Night Before..” books, they are worth a look this time of year. They make great primers on a host of subjects. Not only on holidays like Hanukkah and Christmas, but others such as Thanksgiving, Easter, Mother’s and Father’s Day, St. Patrick’s Day, and other notable family centered celebrations. And many other meaningful events in young reader’s lives like Summer Camp, Preschool, Kindergarten, First Grade, Birthdays and, of course, the seminal, “The Night Before Christmas” are part of this “Night Before…” series. Evenings before special family events are filled with traditional preparations that are familiar to most families, with Ms. Wing finding many main days to celebrate, along with Amy Wummer, providing illustrations that oddly remind me of the Berenstain Bear books. And I mean that as a compliment! Hanukkah is a pretty tough word to rhyme, no? How about “harmonica?” I tried. The Festival of Lights begins with kids “nestled” in beds, dreaming of chocolate gelt (coins), with an honored, heirloom menorah from great-grandma Claire, placed in the window for eight nights. And with each night, new family fun is played out and shared, with spinning dreidels, eight days of gifts, delightfully deep fried potato latkes, doughnuts oozing jelly, made by Uncle Dan, and a brisket with gravy, whose celebratory scents fill the family kitchen. The ancient story of the Jewish heroes, the Maccabees, is retold anew, as the tale of a miracle of a small amount of oil, burning brightly in a cleaned holy temple for eight days. Natasha Wing continues to hit all the right notes in her poetic tellings of family-centered traditions and holidays that emphasize the importance of happenings that are family centered. In a world desperately in need of something to believe in that lasts, family is a pretty great place to start. we wished a Happy Hanukkah to all – the Festival of Lights!